Aberdeen, Maryland - Larry and Peggy West stopped by Aberdeen, Maryland, where Larry presented the We Care Evangelism Seminar. At the end of Saturday, Christians kneeled before the Throne, asking God to empower them for our SAR (Search And Rescue) Mission for souls. What beautiful hearts they are in this congregation of God's people. We have just purchased www.wecareministries.com!! It’s up! It was not obtainable when we first began looking years ago for a web name. But now we actually have our name as a web address, and it's even a Dot Com! So, now, you can type the We Care Today address (maybe that is how you got to this page at present time) or you can now type the We Care Ministries address … either one … and both will take you to our web site! Praise God! Annnnnd, hey, ... here's more good news! Ah-HA! If you will notice our button above you will see our DVD Gospel presentation, the one called, "Let's Get Real! What If The Lord Were To Come Right Now?" is now on Google Video! And you can download it even on IPod and Sony PSP! So, spread that news, and let's get the Gospel out there around the world!! You will also see it is on AOL Video. From there you can IM it and e mail it as well! Click on it! In fact, click on both of them every once in a while. The more all this is viewed the more they stay at the top of the search, making it easier for seekers for salvation around the world to find us and our Gospel presentation. And pass on this info to others! 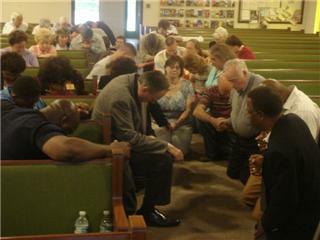 More souls have come to Christ in Waterbury, Connecticut, since we closed out the campaign there just a few days ago! For those of you who know these names, Rebecca Clark, local, just wrote an e mail, saying, “I'm about to burst! Yesterday afternoon Carol DiMeco was baptized! And she brought one! 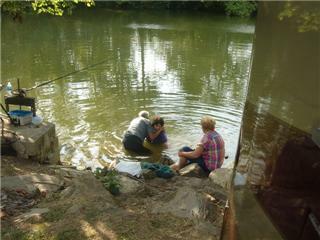 She has been talking with her 22-year-old granddaughter (Melissa Carangelo), who came yesterday to be baptized as well! It makes me think of the apostles. 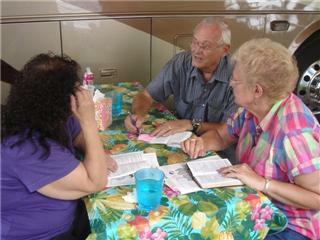 “Because of We Care we finally got to sit down with Carol and study. Because of Ruby's (Oden, Cadre) sweetness, Carol understands why her infant sprinkling is not obedience. Indeed, yesterday was a great day! We are about to begin our next campaign in western Oklahoma, in Cordell. We will be giving you reports as we see it unfold. We haven’t been able to keep this page up during the last few days. We have been DRIVING from Connecticut to Oklahoma! Every day! Pray we see many come to Christ now in Oklahoma. Sevierville, Tennessee - On our way through Tennessee, Ohio, Maryland and into Connecticut for our next We Care Campaign, we overnighted in Sevierville, Tennessee. At the desk of the RV park where we checked in, two ladies were running the desk. ''What do you do?" That always starts it. "Well, we travel the country and teach Christians how to get their friends to Heaven!" It was difficult to talk with them further at their business. Larry West and Bill Oden both walked outside. Then, Bill turned to again go inside to get another cup of coffee. 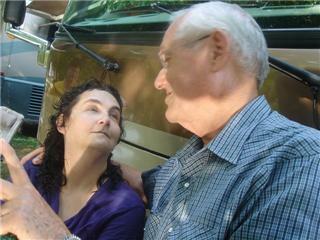 One of the two ladies, Jean Law, asked Bill, "Are you an evangelist too like Mr. West is?" When he said he was, she responded, "I need to talk to you." 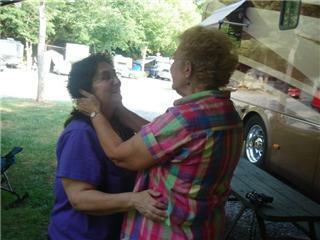 Jean then came to our RVs when she got off work. Jean too lives in the RV park. Jesus really says, "As you go into all the world PREACH THE GOSPEL!" YOU TOO can do this very thing! That day "Law found grace!" Praise God! And pray for Jean. We have already turned her over to local Christians for mentoring.